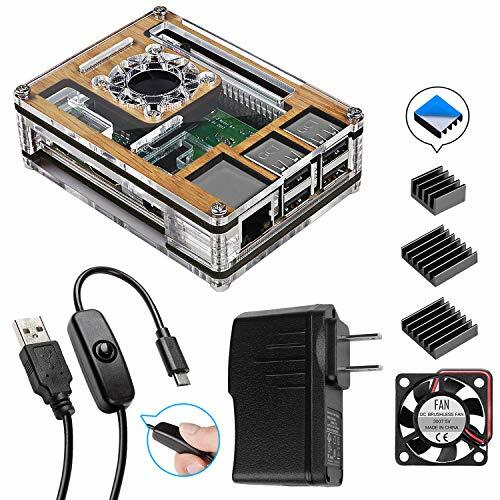 1) This 9 layers case is not compatible with the new version Raspberry pi 3 model B+, because the PoE pins and slight re-positioning of a chip so that it does not compatible with this case's layers. 2) If there has any issue of your case kit(with broken pieces or miss any accessory), please contact us to get quick support via Amazon. Good ventilation - 3pcs aluminium heatsinks + 1 cooling fan to keep pi cool. Easy to control the charging of Pi with ON/OFF switch micro USB cable. Allow GPIO ports and various port's for Raspberry pi 3 access. 5V/2.5A Power Supply and 59 inch Micro USB Cord are included. If you have any questions about this product by Smraza, contact us by completing and submitting the form below. If you are looking for a specif part number, please include it with your message.